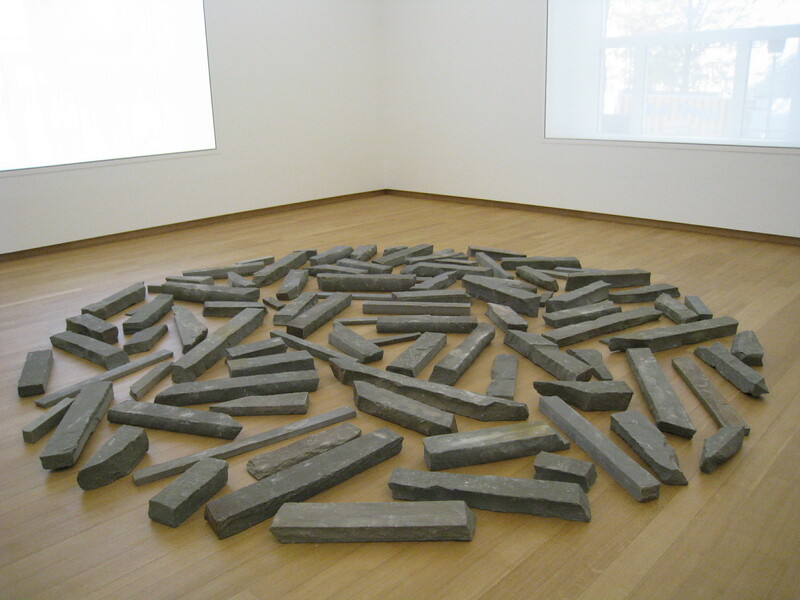 A few weeks ago, on a visit to the The Temporary Stedelijk in Amsterdam, I came across Bluestone Circle, a work by Richard Long. According to the artist’s annotations on the piece, it must always be arranged in a circle with a prescribed diameter of 4.86 meters, but “the concept should be realized partly on the basis of the curator’s own insight” and never copied. So, every time it is shown, the stones are set out differently. I found the work very beautiful, the texture and tint of the stones held my attention, and arranged on the unscuffed floor of a brand new, skillfully lit and otherwise empty space, it seemed so peaceful. However, who is the artist here? Richard Long, who presumably chose the stones and set out the original circle, or the curator? Or both? And who cut the stones? Surely, those straight sides are not their natural shape. A week later, my partner-in-arts and I made another visit to the Temporary Stedelijk to continue our exploration upstairs. There, we found another piece by Richard Long, 17 Stones in a Line. (Count them, if you wish…). The name for what Richard Long does is Land Art. Also known as Earth art. It can be seen as part of the wider Conceptual art movement in the 1960s and 1970s. Land artists began working directly in the landscape, sculpting it into earthworks or making structures with rocks or twigs. Some of them used mechanical earth-moving equipment, but Richard Long simply walked up and down until he had made a mark in the earth. Land art was usually documented in artworks using photographs and maps which the artist could exhibit in a gallery. Land artists also made Land art in the gallery by bringing in material from the landscape and using it to create installations. One of the most famous and durable land art works is Spiral Jetty built by Robert Smithson in the Great Salt Lake in Utah in 1970. 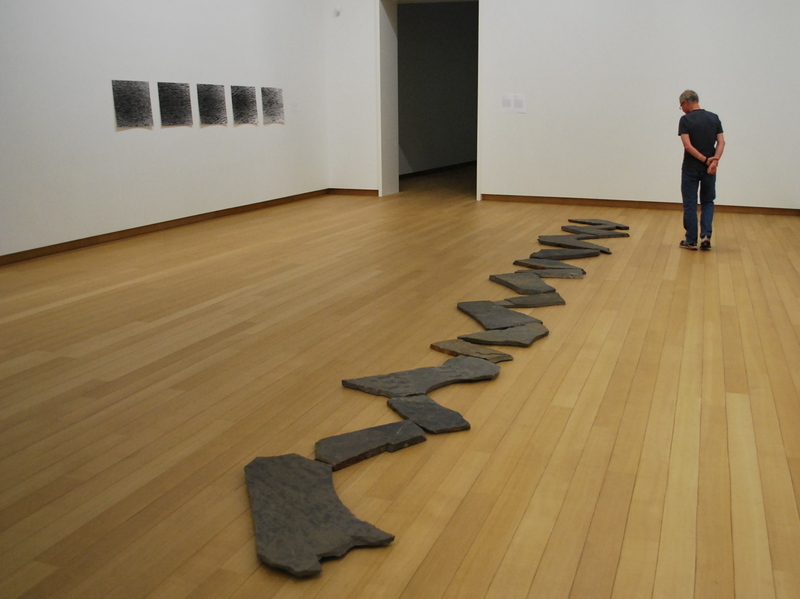 I saw a black-and-white, rather grainy film of the construction of the Spiral Jetty at the Stedelijk on another visit about a year ago, but at the time, I had no idea what I was looking at. I was simply intrigued by the closeups of earth-moving equipment, gravel and water. (Always have had a weakness for excavators.) It is only now, after seeing Richard Long’s pieces that I found out there is such a thing as Land Art. Spiral Jetty is an example of Land Art that might remain for hundreds, if not thousands of years, but other works are far more transient. Scarlett Hooft Graafland manipulates and interacts with the land in surprising ways, using her imagination, transient props, the cooperation of local people and her own body to create the pieces, which she then photographs. She works in remote areas in the Arctic North, on salt flats in Bolivia, in rural China but also in the natural, flat Dutch landscape. This autumn, the Huis Marseille in Amsterdam is hosting a retrospective of her work. There are a few photos on the museum website, more photos of her work in the Arctic are included with an interview in Don’t Panic online magazine. The thing to know about Hooft Graafland’s work is that it’s all for real. She never uses Photoshop to enhance the images she takes of her works. The Lemonade Igloo was built out of blocks of ice made by mixing Kool-Aid with water and leaving it to freeze in the Arctic cold. The bare legs draped over the roof of a hut in Iceland are hers and a local girl took the photo. An amazingly beautiful photo of women perched on the ridge of a large traditional roof somewhere in rural China are local girls who cooperated with her work. The one blue reindeer in a herd of hundreds has somehow been persuaded to tolerate its blue enhancement, but I have no idea how! She spends months in the environments she chooses for her work, and there’s no faking, enhancing or tweaking the record. It’s all for real, if transient. Lis-Britt, good morning! We still have snow outside our Mamaroneck windows (your partner-in-art”(?)) knows the place well as he assisted in some of its constructive deconstruction…) and have not only just read this interesting piece but also took your suggestion to view the SmartHistory vids. click on a “block” and spend some time listening to what the speakers are viewing.